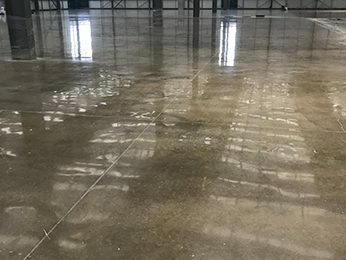 The question “how do I refurbish my existing, tired and weary concrete floor slab without having to spend a lot of money on expensive resins and or floor painting ”, is a very common one. The answer Mr Customer is now available with immediate effect in the form of the Floor Renovation System, Level Best Concrete Flooring are now offering. 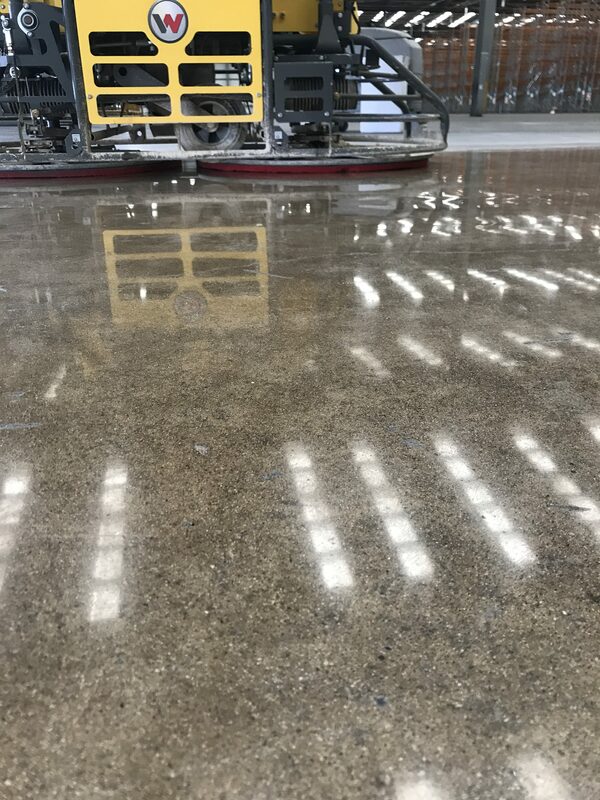 The Floor Renovation System does not effect the structural integrity of the concrete floor slab it enhances it, by removing the microscopic top layer of roughness on the concrete floor by using a patented grinding and polishing method. 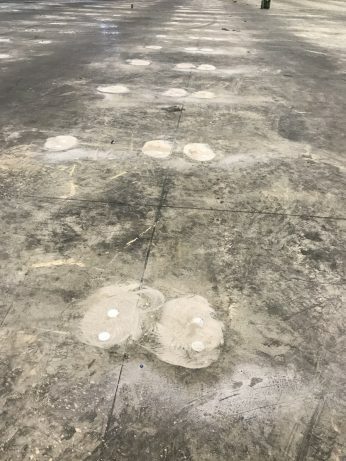 The grinding to the floor is so incredibly light, that no step or deviation in layers is formed in the concrete surface. 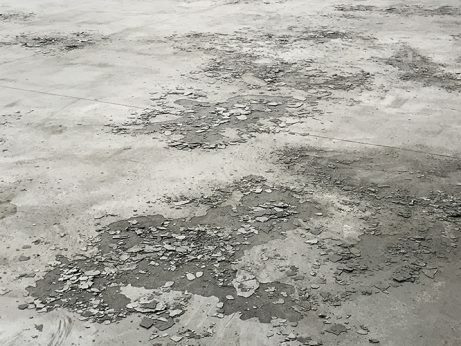 Once applied the densifier penetrates deeply into the concrete surface, a chemical reaction takes place and the mineral dust particles are no longer be able to escape the surface. 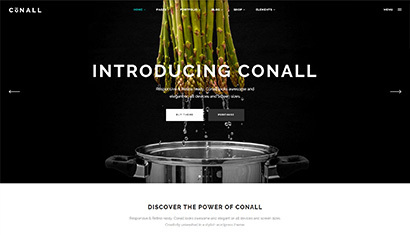 This leaves the treated surface hardened and more abrasion resistant. The above photograph shows the condition of the existing floor slab. A damaged concrete floor increases the risk of accidents and cannot be cleaned sufficiently with daily cleaning. 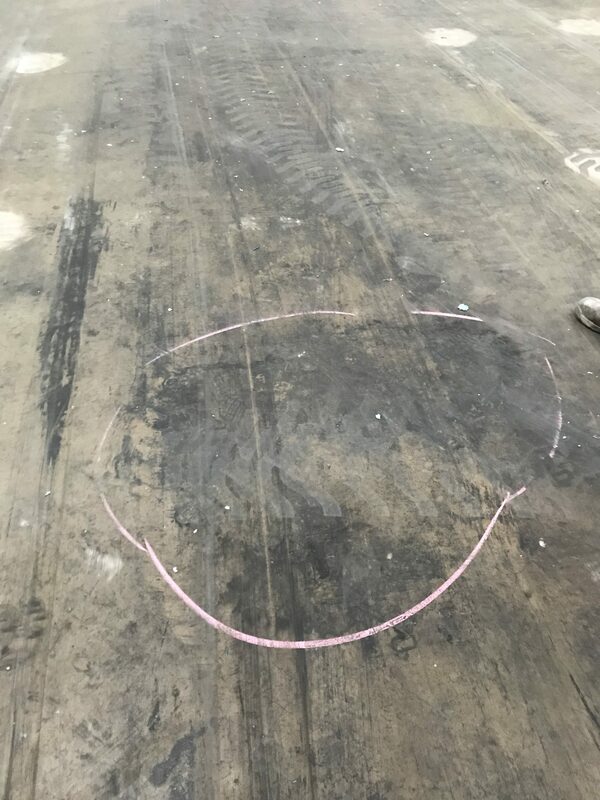 Oil leaks, greases and chemicals penetrate into the core of the concrete and cause considerable damage. 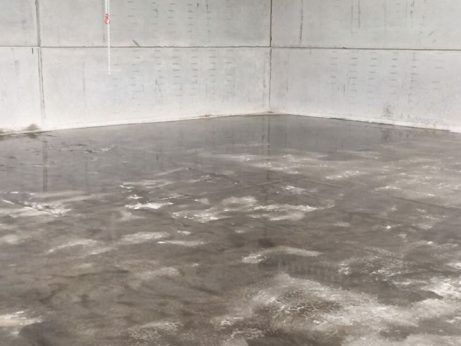 The repair or renovation of a damaged concrete floor entails considerable costs. 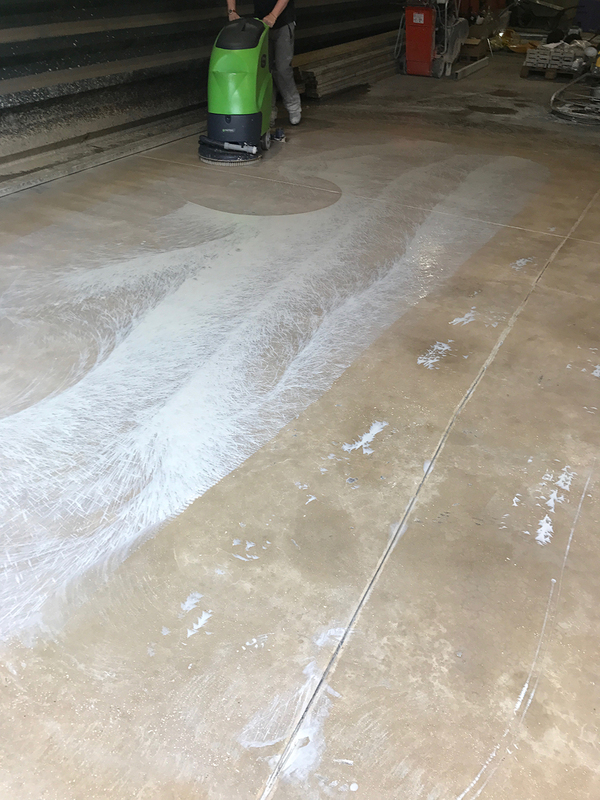 This is not the case for the unique Level Best FRS grinding and polishing system for the improvement and protection of concrete floors. 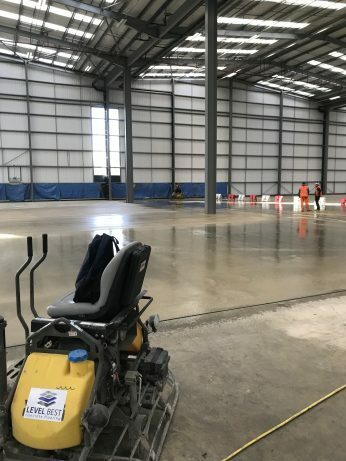 The above video shows the phase 2 of the FRS being carried out in a warehouse near Howden near Goole in East Yorkshire where the Level Best Concrete Flooring operatives carried out a full project in just 2 days from start to finish. 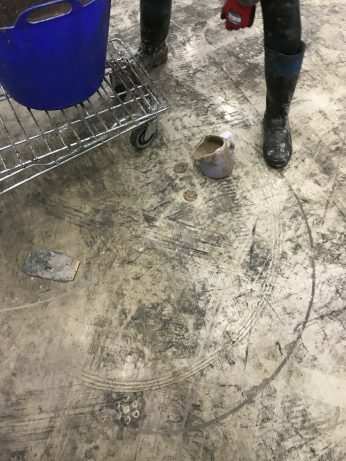 The video shows the floor receiving a vigorous panning in order to remove all of the dirt and grime from the concrete. How does Level Best FRS work? 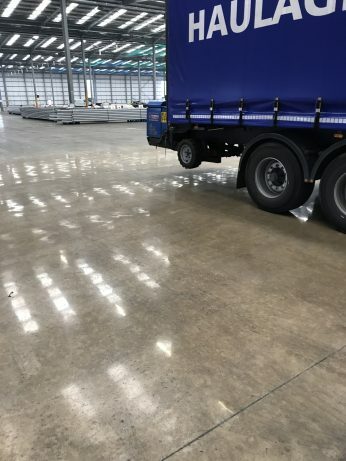 With our Floor Renovation System you will transform your old and dusty floor of concrete into an extremely hard, dust proof, durable and abrasion resistant surface. FRS consists of two powerful components. On the one hand FRS Densifier, on the other FRS Protective Sealer. The densifier penetrates deep into the core of the concrete and hardens and compacts it due to a molecular reaction. 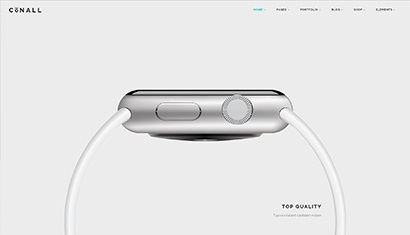 It creates a very hard and extremely abrasion resistant surface. 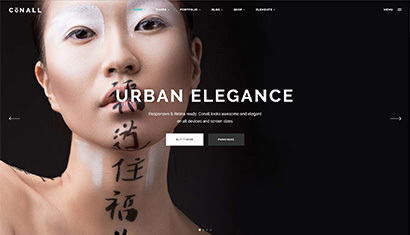 Unlike superficial concrete coatings, FRS penetrates deep into the core of the concrete and chemically bonds the particles to a 400% more resistant surface. 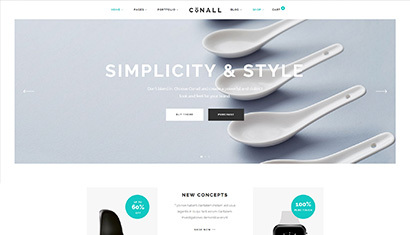 This offers ideal conditions for daily traffic of heavy vehicles and people. The 6-step process creates a high gloss on your concrete floor. After the application, the surface will be extremely hard, very resistant to abrasion, dust proof and easy to clean. The concrete floor will be protected against water, oil or grease stains. 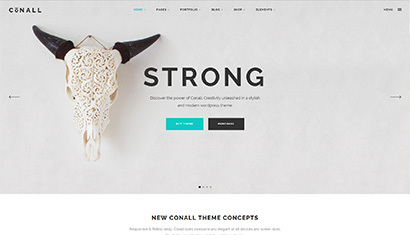 The maintenance costs are reduced to a minimum. The high reflectivity results in a significant energy saving and CO2 emissions in a building are significantly reduced. Level Best arrive on site to carry out the next Floor Renovation project at a warehouse in Northamptonshire. The above photograph shows a close up of the Floor Renovation System following the recent completion of a project in Milton Keynes. 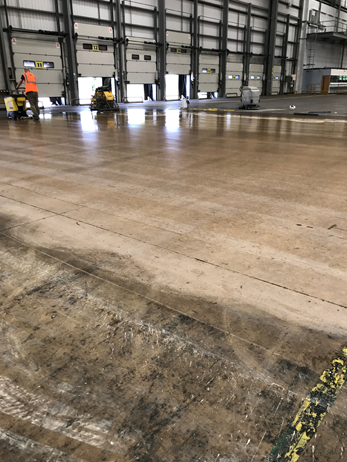 This photograph shows a good comparison of how the warehouse floor looks after the Floor Renovation System has been carried out and how the floor looked previously. 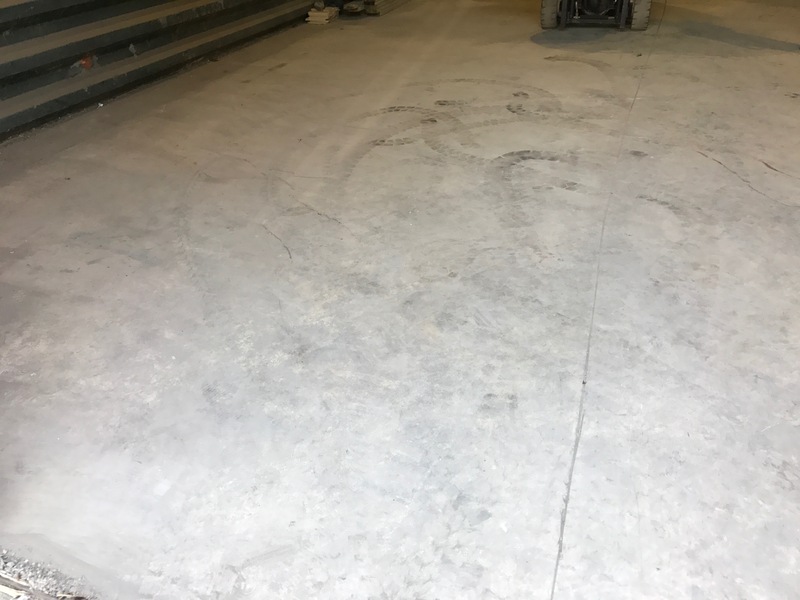 The above photograph shows how the concrete floor looks after phase 3 of the Floor Renovation System process has been carried out. This warehouse in the Midlands will be completed by the Level Best Concrete Flooring FRS team in late December 2017. As you can see from the attached photograph the products are all clear in colour, yet still enhance the aesthetics of the concrete surface as well as providing many other benefits. 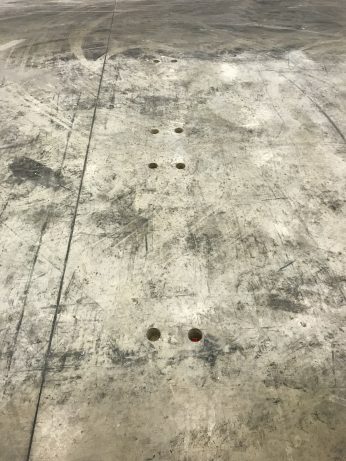 This warehouse concrete floor slab had delaminated almost everywhere on the slab. Level Best was contracted to carry out the surface renovation using their FRS specialist system. 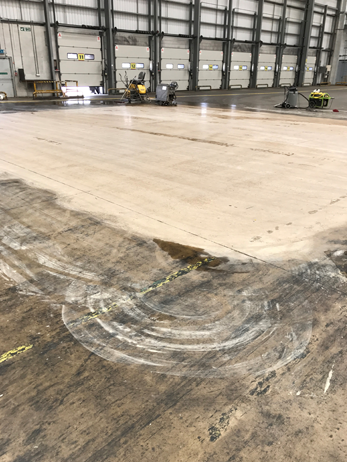 Initial the concrete surface received a vigorous floor grind to take off the loose material. 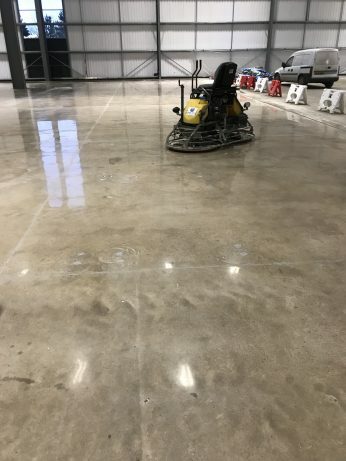 On completion of the concrete floor grinding the polishing system using the “ride on” floats and liquid densifying products were carried out on the surface of the floor slab. 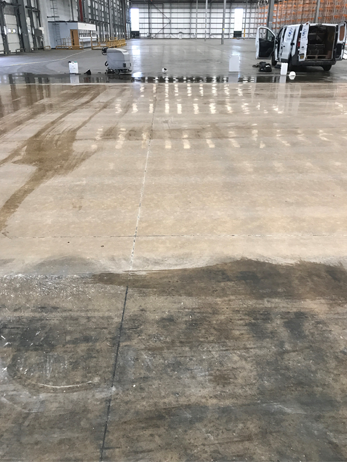 This floor renovation process vastly improves the surface integrity of the concrete to provide an extremely tough and hardened surface finish. Floor sealers are then applied to leave a dust free concrete floor, which will last for a long time. 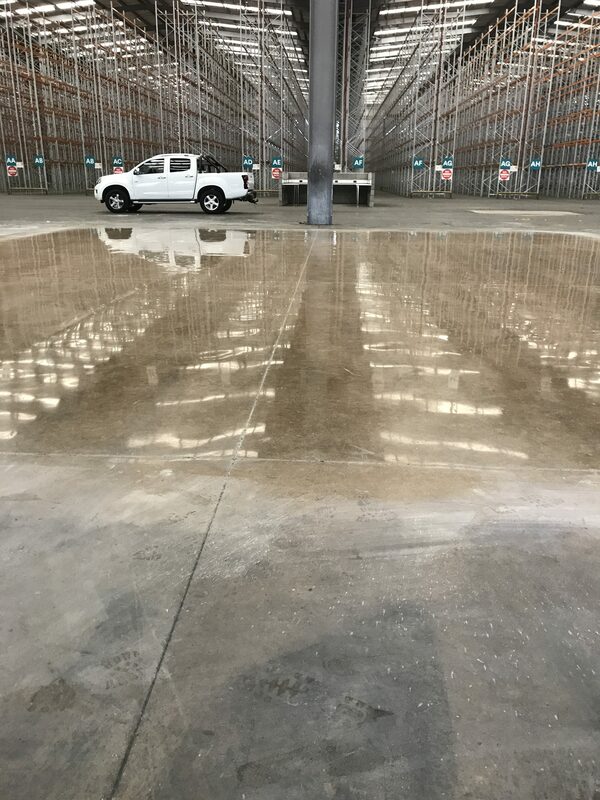 The condition of the warehouse concrete slab on completion of the Floor Renovation System. As you can see Level Best have returned the floor to better than a new concrete floor slab. 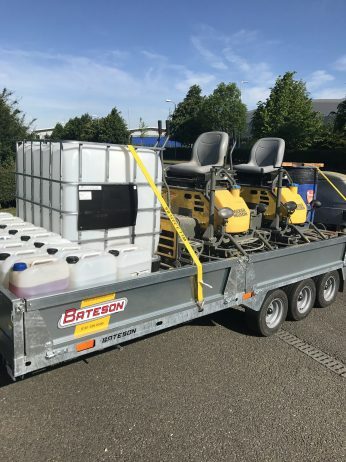 With the influx of work for the Level Best Concrete Flooring Renovation System, the company has invested in a new vehicle to cater for demand. 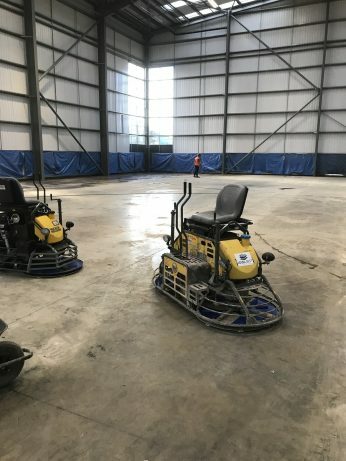 Adam Brown the companies estimator quotes “with FRS projects now live on site and with Level Best’s workload also increasing for new cast insitu concrete floor slabs this new vehicle will help us immensely in our quest to offer excellent customer service”. 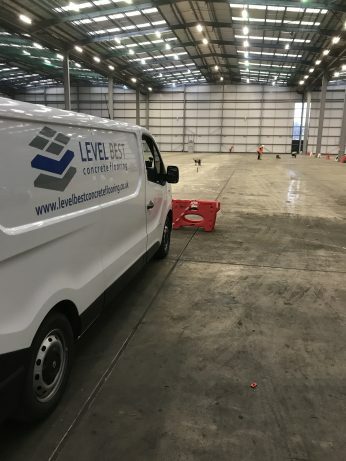 Level Best Concrete Flooring are now about to set work on another Floor Renovation System project in the Midlands for an existing warehouse and are always on the lookout for new opportunities with new customers. 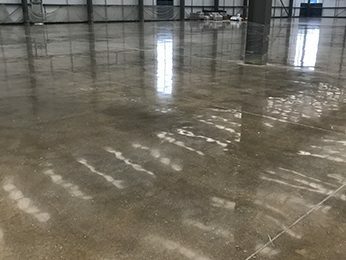 Please feel free to contact the office on 01405 819199 or email enquires@levelbestconcreteflooring.co.uk if you would like to new how we can renovate your existing industrial warehouse concrete floor slabs for you.